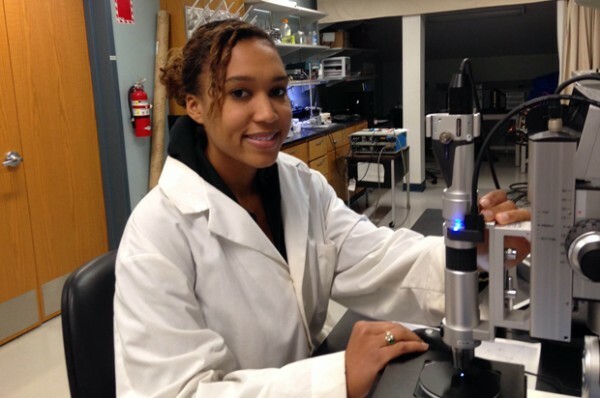 Ariel Ash-Shakoor, a bioengineering Ph.D. student, studies how cells behave on specialized polymers in the Syracuse Biomaterials Institute (SBI), and is a founder of K-12 STEM tutoring program in the Syracuse City School District that aims to inspire deeper interest in science, technology, engineering, and mathematics. She came to Syracuse University to be a part of the Soft Interfaces Integrative Graduate Education and Research Traineeship (IGERT) where she conducts research alongside people in different scientific disciplines. Q. Why did you choose to pursue bioengineering? A. I’ve always hated going to the doctor’s office, but I’m interested in the medical field. I wouldn’t want to have to deal with the painful interpersonal parts of being a doctor, like delivering bad news about someone’s loved one. I’d prefer to have an anonymous contribution in helping people, and I can do that through bioengineering. Everyday, bioengineers are creating the tools that doctors use to help people. As a bioengineer you can have a broader impact. You can make one tool or instrument that can be used all over the country to help people. Q. Why did you choose Syracuse University? A. Because of IGERT and the industry-style lab in SBI. SBI is a shared, collaborative space for researchers. At other schools, you’ll have professors with their own lab spaces with different equipment and you have to ask them to use it. SBI is an open space. You can interact with other grad students who are advised by other professors in other disciplines. It is definitely an advantage that Syracuse has over other universities. A. Anyone who’s ever had a cut knows that it usually takes a week or two to heal. The technology that I’m using combines two types of polymer systems. One polymer can memorize its shape and change shape when it’s in the body at body temperature. The other is able to hold positive or negative charges that encourage certain cells to stick to the biomaterial. If we are able to change the shape of the charged biomaterial, then it forms wrinkles on the surface. Cells stick to it and align along the wrinkles. Research from our lab shows that when cells are aligned along the wrinkles they tend to move at a faster rate. We see potential for using it to close a wound quicker. Q. What inspired you to start a K-12 STEM program? A. I always wanted to start my own tutoring program. When I first arrived in Syracuse, I was helping with the Martin Luther King Jr. Maker Hall at Fowler and I met the program director for the Syracuse Northeast Community center, Jason Howard. He was interested in creating an after-school STEM program there. We kicked it off last spring. In addition to providing tutors for 20 to 25 students, we put on fun STEM demonstrations, like making ice cream to teach boiling points and phases of liquids or making “Oobleck” from the Dr. Seuss book to teach about shear thickening fluids. Q. What do you hope your program accomplishes? A. I want the students to succeed in their classes. If they are improving their scores or their behavior, then we are succeeding. Ideally, I want them all to go to college. It’s OK if they don’t choose STEM. I just hope they pursue college no matter which discipline they choose. At the same time, minorities and women are still sorely underrepresented in STEM. It’s important to me as an African-American woman in engineering to connect with young students to show them what they can accomplish by example. I think it inspires kids to think, “I could be that person. I should go to college.” Simply knowing college students that look like them opens up new possibilities they may not have realized existed. A. In the immediate future, I want to continue to build the STEM program. We are always looking for SU students to volunteer as tutors. After Syracuse, I’d want to become a professor. I think that I would still want to pursue community outreach with my grad students. I want to give high school students the opportunity to experience research at a university. I’m even thinking of creating something that could go national. It’s all about having a big impact in helping people.